This ‘how to build a robot’ series gives you the complete step-by-step tutorials which aims to help robotic beginners to make their own robot that based on Arduino. The tutorial goes through the basic knowledge of a robot (how to use the tools, how to assemble your own robot, how to program and how to make your robot move) to more advanced functions (obstacle avoidance, line tracking, lighting and sound effect, environmental monitoring, Bluetooth Control). The tutorial is filled with tons of pictures and diagrams so that anyone can build their own Arduino robot without any difficulty! Generally speaking, a robot is virtual artificial or mechanical agent that is able to react to its environment and autonomously decide actions to achieve the particular goal. These characters distinct robots from things like cars or toaster as they could not perceive their environment. Robot is usually controlled by an electronic circuitry or computer program. 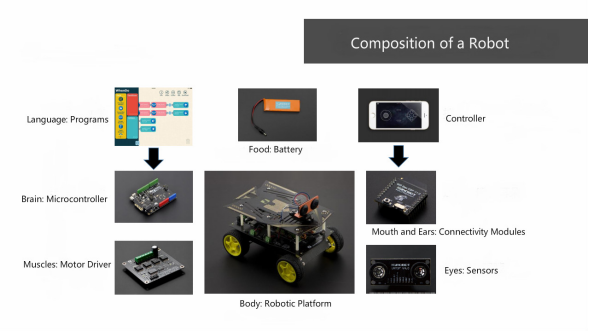 Here I made a picture indicating the basic composition of an Arduino robot. The robotic platform is the body of a robot that decide it will look like and what it will do. Wheeled platform is currently the most common one. Compared with others, it has several advantages such as the relatively low-cost, abundance of choice as well as the simple design and construction. It is highly suggested for robotic beginners. 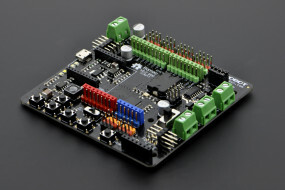 A microcontroller is the brain of a robot as it is able to execute a program and therefore in charge of all decision making, computation as well as communications. 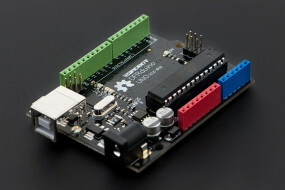 The DFRduino UNO (the same as Arduino UNO) and Romeo are two popular microcontrollers for DIY Arduino robot. Motors are devices that could convert electrical energy into physical motion while motor drivers act as the intermediate device between a microcontroller, a battery and motors. It provide the current at the required voltage and work together with microcontrollers to make the motors move appropriately. Robots have the capability to perceive surroundings thanks to various electromechanical sensors. For example, an infrared sensor could help an Arduino robot to detect the distance between itself and an object and then fed back this information to the arduino microcontroller; a grayscale sensor is needed to make a line-tracking robot. Before we start making a robot, it would be better to know some essential tools. Screwdriver, a tool for turning screws (driving or removing) is indispensable for building a robot. We suggest that you get yourself a screwdriver set, which is extremely convenient in dealing with screws of different types and sizes. A soldering pencil is a tool frequently used in electronics projects for soldering and de-soldering work on circuit boards. We’ll need it in this project to solder the motors’ cables. NOTE: Once heated, the tip of the soldering pencil will become extremely hot. If you have never used a soldering pencil before, please spend some time familiarizing yourself with how to use the pencil. BE CAREFUL when using the soldering pencil! Needle-nose plierse are often used to cut off excess length from cables and wires. We won’t be using the pliers much for this project; however, they’re an essential tool in electronics projects. 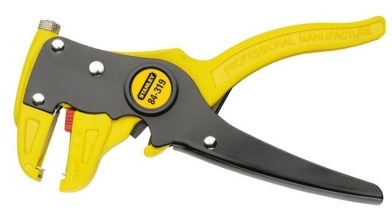 A wire stripper is a hand-held tool used to strip the electrical insulation off of wires. The wire stripper can also be replaced with scissors if needed. When using this tool, only the first layer of insulation needs to be stripped, exposing the lead wire inside. This helps make the soldering process easier.